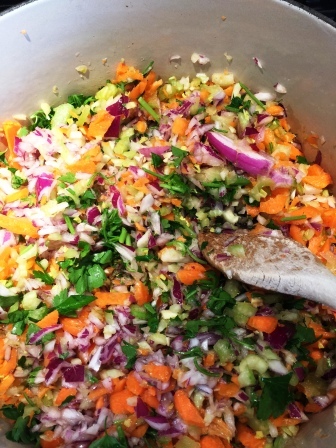 I approached my second ribollita since 1989 with some trepidation. I have a memory of the first one but it is somewhat hazy. Something made us remember the first one other than it being a special time in our lives. It is an impossibly high bar to beat. I looked online at a few recipes and the one which appealed was the River Cafe one I saw on culinate.com. There are a few recipes but this is the one which reminded me most of what we had eaten. this stage the colour and the smells from the pot are fantastic. I couldn’t help myself varying the recipe slightly even at this stage. I’d got some lovely mini parsnips that I thought could add texture and flavour but would still be in the same flavour palette. The thirty minute stages mean there is plenty of time to relax and prepare other things so I used the opportunity to roast the little parsnips. They really were small so I wanted a proper crust on the outside otherwise they would just disappear into the background. In the end they have added a nice sweetness to the vegetable mix as well. If I hadn’t had the really nice ingredient I would have just stuck to the original recipe but these were really tasty parsnips which would have gone to waste if I hadn’t added them in. I even sluiced the baking tray with boiling water to try and preserve every bit of flavour I could. 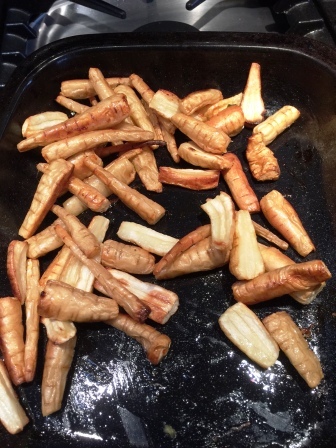 Roast mini-parsnips – skin on they look a little like mealworms! 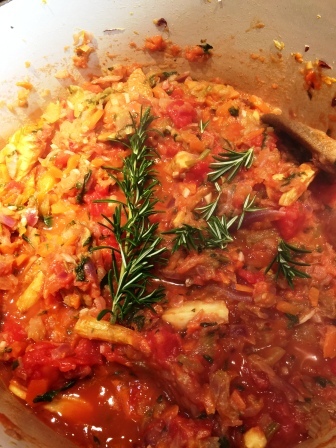 The second thirty minutes involves adding tomatoes. The recipe suggest juiceless plum tomatoes but I used chopped which probably means more liquid so a knew I should control the liquid later on. I also put the pieces of roast parsnip in at this stage. Everything combines through this slow, structured cooking and the finished ‘soup’ is as much textural as flavour. This is really cooking against a distant memory but I knew I was on the right track. and I don’t remember it being that dominant a feature of the original. I went with 2lbs including stalks, chopped slightly more finely to ensure it cooked, and I am happy with the result. The beans are also added at this stage. I didn’t use dried beans and used two cans instead. I puréed one and added the unpureed can at this stage. 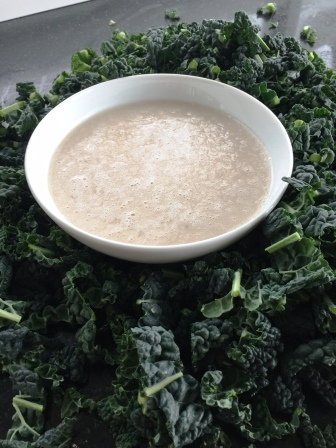 The purée is a clever move, it adds creaminess as well as flavour. After an hour and a half we are in the ‘finishing stage’. I swapped the suggested ciabatta for some of Big Pete’s sourdough that I kept especially and seasoned. This takes a huge amount of salt and pepper but go on the conservative side if you are following Rose and Ruth’s suggestion of topping with Parmesan. Other recipes suggest finishing off a portion under the grill. The amount of moisture is crucial. In my mind the nearest equivalent is a good bread and butter pudding with some crunch on top, a moist middle but a clean dish at the end. there is a lot of scope for adapting the recipe here to suit your own preferences. The authors do highlight the need to keep the balance between bread and liquid at this point. Ribollita is also even better the following day so you need to go through the whole judgement call again then. In the end I have made the ribollita I intended. It takes some time but it is a fabulous winter comfort food. I don’t think I’ll be leaving it for another 25 years before I cook it again. 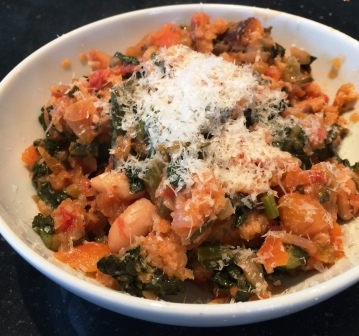 This entry was posted in Recipe and tagged cannellini beans, carrots, cavolo nero, celery, culinate.com, Florence, garlic, parsnips, red onion, ribollita, River Cafe, stale bread, tomato, Tuscan. Bookmark the permalink.